Description: Dye your own rainbow! After a brief intro to the basics of using acid dyes on silk, you'll work in groups to dye assigned sections of the color wheel - yellow to red, for example. 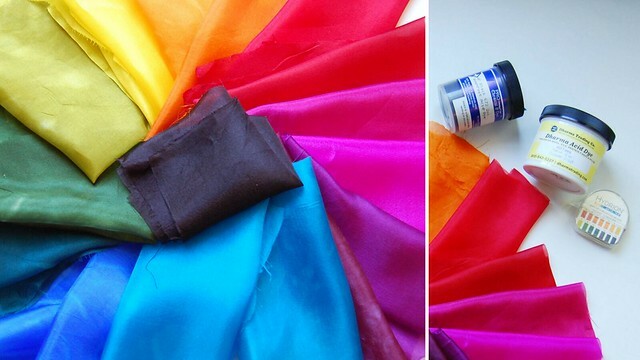 Next, you'll work individually to dye a "silk swirl" with your favorite colors. You'll finish up by creating your own color wheel using small swatches cut from the rainbow-dyed fabrics and then discussing your individual swirl results. Don't miss this chance to try silk dyeing and see for yourself just how quick, easy, fun, and rewarding it is. Gale Evans has loved fiber arts ever since her grandmother taught her needlepoint and cross stitch in elementary school. She didn't focus on that love, though, until she studied indigo dyeing in Fukuoka, Japan and batik in Indonesia during her five-year stay in Japan. When she returned to the US in her early 30's, Gale put a serious career spin on her amateur obsession, and she's been dyeing yarns and fibers for Gale’s Art ever since. Gale sells her art through her website, www.galesart.com, and at a variety of festivals and shows across the country. Required Supplies: Apron, gloves, note-taking supplies. Supply Fee: $10, payable to the instructor at the beginning of class. If you have trouble registering or paying (Safari users!) or if you are concerned that this website does not have an https address, please use the following direct link for registration and payment: https://sefaa.secure.force.com/Programs/CnP_PaaS_EVT__ExternalRegistrationPage?event_id=a0u0V00000day13QAA. Sorry, this class is over. Please visit SEFAA's website for upcoming classes, workshops, exhibitions, and events. You can also sign up for SEFAA's monthly E-newsletter to receive news and information directly in your inbox.